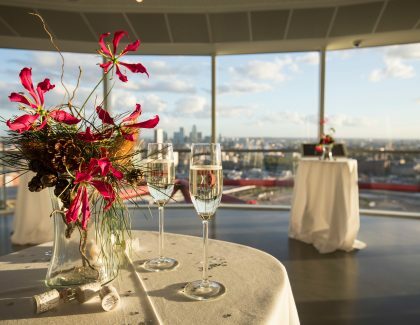 Take your event to new heights at the ArcelorMittal Orbit. Journey 262ft into the clouds and enjoy a breath taking panorama of up to 20 miles across London at our award-winning events venue. Our flexible spaces can be used for team building, conferences, parties and so much more, we can accommodate up to 270 guests standing or up to 140 seated. With a feast of fantastic food packages – there will be something to suit all tastes! We also offer a wide range of entertainment for your event, from DJ’s to aerial dancers suspended outside, 262ft above the ground! 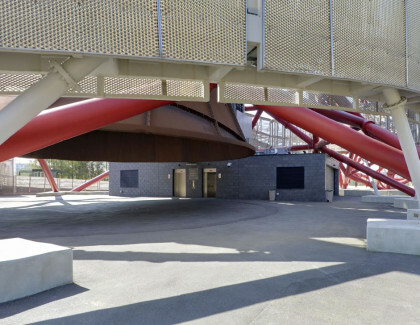 A hospitality suite is also available at the base of the ArcelorMittal Orbit at The Last Drop. 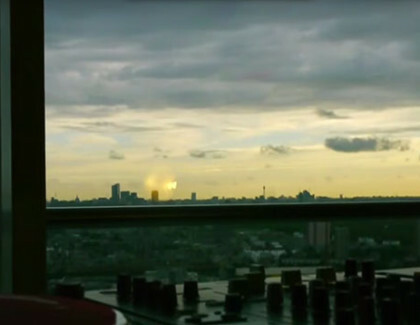 For more information and to talk through how our team can make your event as unforgettable as the stunning view, please contact us or call 020 8221 9114. We can also cater to a range of dietary requirements and requests, including Asian specialties, Kosher and Halal. Why not make your event truly unique and hire The Slide, the world’s longest and tallest tunnel slide! Perfect for ice-breaking or team-building days, experience thrilling drops and curves as you loop the ArcelorMittal Orbit 12 times in this 40 second descent, ending with a tight corkscrew named the ‘bettfeder’, bedspring in German. You and your guests will travel at speeds of up to 15mph as you travel through light and dark sections, watching the skyline whizz by!